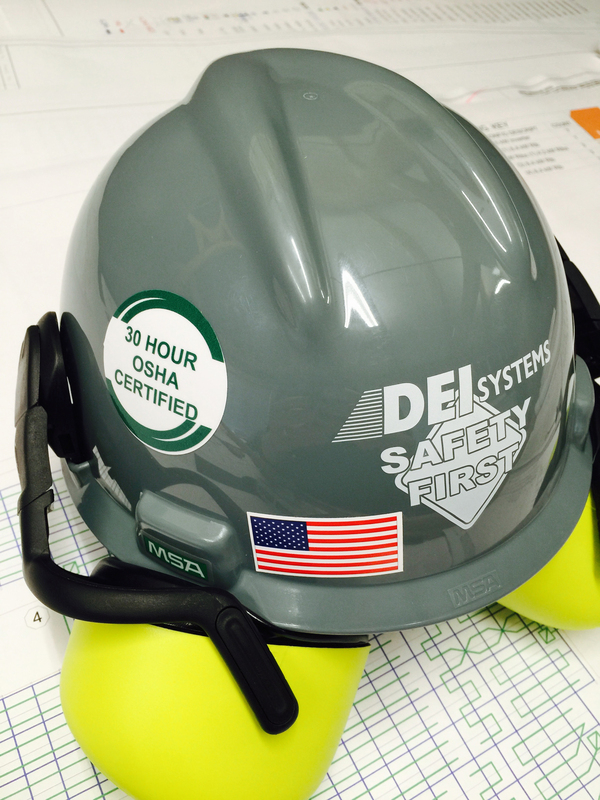 DEI Systems promotes a safe and healthy working environment. Our policy is the strict enforcement of these safe working practices we’ve enacted. DEI Systems shall make every reasonable effort to provide optimum protection and to comply with all applicable environmental, safety and health regulations. These are adaptive measures taken to meet the needs of each different project. DEI Systems ensures that all items furnished and all work performed will comply with the applicable requirements of the Occupational Safety and Health Act of 1970 (OSHA), EPA, state and local regulations and the standards and regulations prescribed there under. If they are deemed not in compliance they are permanently removed. Lock Out-Tag Out Procedures when maintenance is required around live equipment. High Vis clothing when required. Bright Colors as typical company uniform. DEI will employ only properly trained persons who are competent in the performance of their trades, callings, and duties. DEI Will comply with the environmental and safety rules contained herein. DEI is not relieved of any of the obligations under statute and law.